How Can Communication Training Help Build My Career? Whether negotiating a deal, networking with business contacts, or conducting a meeting, strong communication skills are an essential component of professional success. Poor communication skills can be a significant professional roadblock, and can cost you money, a promotion, or even your job. That’s where communication training comes in. At Corporate Speech Solutions, we are a team of communication experts who can help you build and strengthen your communication skills and give you the tools to advance your career. 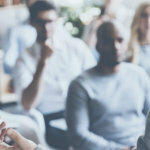 All of our trainers are certified and licensed corporate speech-language pathologists, whose expertise allows them to pinpoint exactly which communication challenges are impacting you the most and can help you make the changes that will help you develop the ability to communicate with clarity and confidence. Developing a Dynamic Voice: Whether you’re addressing an audience of a thousand or in one-on-one conversation, a strong, dynamic speaking voice is key to professional success. A corporate speech-language pathologist can help you learn to develop your breath support to improve vocal quality and strength. They might also work on modifying vocal quality issues, such as an overly nasal or high-pitched voice. Improving Clarity: Unclear speech not only makes it difficult for your listener to understand your message; it also sounds unprofessional and sloppy. Our trainers help people who habitually mumble, speak too quickly, have unclear speech, or have a regional or non-native accent that is getting in the way of their communication. Presentation Skills: Public speaking is a common fear; however, at one time or another, most professionals need to speak in front of a group. A professional communication coach can help you develop the skills to effectively craft a top-of-the-line presentation, and deliver it in a way that makes an impact. Confident Communication: Body language, tone of voice, word choice—there are so many factors that go into projecting confidence. Communication training can help you develop the skills to speak like a leader.